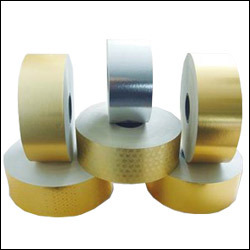 Plastic Adhesive Tapes, PVC Insulation Tapes, Polyester Self Adhesive Electrical Insulation Tapes, Polyamide Tapes, Teflon Self Adhesive Tapes, Glass Cloth Self Adhesive Tapes, B Class, F Class, H Class Self Adhesive Tapes, Cotton Non Adhesive Tapes, Black Rayon Tapes, White Rayon Tapes, Pink Rayon Tapes, High Temperature Masking Tapes, Manufacturer, Supplier, Exporter, Nashik, Maharashtra, India. Coated Films, PET, BOPP, PVC laminated with Base paper or Paperboard. Glossy, Matte, Holographic. Printable. Used in Cartons and decorative purposes.